Three options for building a second runway at Gatwick Airport have gone out to public consultation. The airport has submitted the plans to the government's review into the need for extra capacity in the south east. All involve building a new runway to the south - parallel with the existing one - although a legal agreement prevents construction until after 2019. Airport chief executive Stewart Wingate said he hoped many views would be expressed over the next six weeks. "The views of the local community are an essential element in shaping Gatwick's second runway options," he said. Option one is for a 585m (0.3 mile) runway south of the existing runway, while options two and three are for a 1,045m (0.6 mile) runway. Options one and two would involve one runway being used for landings and the other used for take-offs. Option three - which is the preferred choice of Gatwick Airport - would see both runways used for landings and take-offs. A new terminal would also be built between the runways. 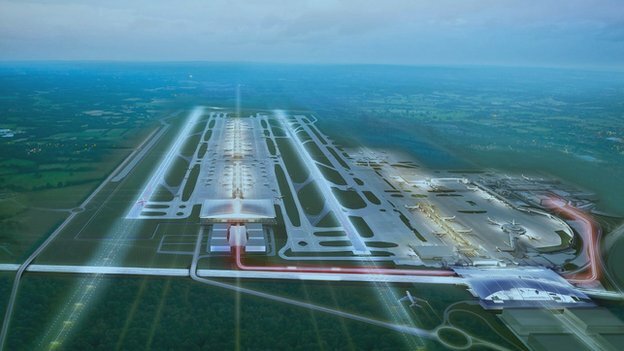 Architect Sir Terry Farrell is working with Gatwick on the proposal for the new £7bn runway. The public consultation ends on the 16th May, with the results due to be published by the summer. The Airports Commission will make recommendations to the government in 2015 on how to meet any need for additional airport capacity in the longer term.